Why aren’t House Republicans suing over executive amnesty? Today the House GOP sued the Obama Administration in federal court over the Administration’s decision to make changes to the version of the Affordable Care Act that Congress passed. The one-two punch from Boehner marks a new era of tension between Republicans who will officially take over Congress in January, and the President who has signaled that despite his party’s losses in the midterms, he plans to proceed with his agenda without GOP cooperation. After two Washington firms pulled out of commitments to represent the House in recent months, Boehner hired George Washington law professor Jonathan Turley earlier this week. Turley is an expert on constitutional law and has appeared on multiple television networks as a legal analyst. Boehner and other top congressional Republican leaders are also contemplating a filing a separate lawsuit challenging the president’s authority to take executive action to give 5 million immigrants temporary status. This move has been coming since July, when the chamber passed House Resolution 676, which authorized the lawsuit. Although lawmakers are already being criticized for not taking immediate action to stop Obama’s executive order on immigration, there’s a good reason for the delay. The moral of the story for Republicans is, it’s time to decide how we want to tackle these orders right now. If we decide on a lawsuit, we’ll have to pass a new resolution that specifically authorizes it. If we decide to tackle this via spending provisions, we’ll also have to commit to a serious change in the law, which, considering we’re dealing with a split caucus, might be more than we’re ready to take on. Maybe there are some procedural tools available to accelerate this particular lawsuit, but I am not aware of them. Litigation is generally a slow process, and the delay from July until November to file does not suggest urgency. There will be a flurry of lawsuits filed in the next few days and weeks. One thing I expect is that most will feature a plea for an injunction against Barracula, maybe with temporary orders directed at specific actions by particular agencies. This guy, ____________, who lives at ______________, did my guy ____________________ wrong. Now he owes him money. The Court has jurisdiction and venue is proper. Now, in Texas, that is enough to get you started…but only started. We allow essentially free amendments to pleadings. That is not necessarily the case in Federal courts, where amendments are often only permissive, so you have to draw your original petition a LOT more carefully. There are fine minds and word-processors humming all through this weekend, and will be all up to Thanksgiving and immediately thereafter. In many jurisdictions a judge ruling on a preliminary or permanent injunction has to weigh factors including possible harm to the public. Will the DOInjustice argue that the illegal immigrants are the public? “WE” have to decide to attack Pres. ScamWOW’s outlawry in EVERY-flucking-possible way RIGHT NOW. One route of attack does NOT preclude or even impinge on any othersssssss. Launch them ALL. Now. Or when you get back from eating turkey, at least. Throw everything we have at them. They’ve been doing it to us for years. It is baloney that de-funding requires a “serious change in the law”. The RINOs are just looking for more excuses to enable themselves to do nothing. And a lawsuit would be another way of doing nothing, as it would only further prove the cowardice of Congress to act on its own, and would place Congress, by such running to the courts, firmly into third place in the Constitutional pecking order, rather than being a co-equal branch. No. That part seems right to me. And it will take some creativity…and some spine. Hopefully, we can find a surfeit of both in light of this crisis. Nonsense. That is exactly A correct thing for Congress to do. Congress cannot issue legal orders, though it DOES write law. The courts issue orders effecting the other two branches, which is their job. But it is A correct thing. There are several others, and some creative people are working on leveling them all that ScamWOW. 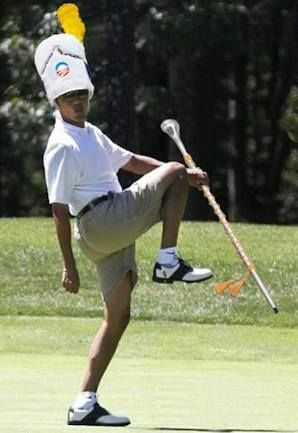 Hey Rags, I think you’ll enjoy the following photo of Obama. See how helpful a “Ferguson-style community organizers” encourages the writing staff? I think this was shortly after the operation. I stand corrected. Evidently there are 2 photos documenting Obama’s education. But that one is definitely after the operation! Regarding, nice photo of Obama celebrating with a trick, uh, er, treat! Professor, please explain. How is USCIS self-funded? Are we collecting $200 dollars for every immigrant that passes “Go”? Good grief. We’re funding an entire agency on immigration fees. How much are we charging these people? Anyway, thanks for the link. It mostly answered my question. – an I-90 to replace or renew a “Green Card” (Permanent Lawful Resident Status Document) is $450. It must be renewed every 10 years or be replaced if severely damaged. – an N-400 to apply for Naturalization costs $595 + and $85 Biometric Fee if you are younger than 75 when you apply. Note: you MUST have been a Green Card holder for at least 3 years PRIOR to applying for Naturalization. So: Minimum cost in FEES alone is: $1,130 ($450 + $680). Form I-129F, $340 – permission to apply for a fiancee visa. Form DS-160, $265 – application for a fiancee visa. Form I-485, $985 – adjustment of status from fiancee to spouse. It is funded by fees. Congress can still restrict how those fees are spent, though – BUT it is just like any other appropriation, requiring Congress to approve and the President to sign, or his veto to be overridden. So the tactic won’t work at all in the lame duck; Reid will never let such a House bill to come to a vote. We can and should try this in the new Congress, but unless 13 Democrats vote to override in the Senate, and about 25 or so Democrats in the House, it will fail. It is still worthwhile to get those Democrats on the record for 2016 and beyond, but it won’t stop Obama’s plan. Uh…..because they are really Democrats? Lawsuit now, AND, request immediate injunction against implementation of proposed changes. The gov can freeze/seize the people’s assets and tie them up in court proceedings to prevent action – why can’t they freeze/seize the lawless executive? The GOP will harrumph and bluster, and in fact do nothing. They are bought and paid for by the US Chamber of Commerce. who want the cheap labor. Well I see the G.O.P.ing trolls are out. That is exactly correct – more immigrants = lower wages for American workers, more money stolen from the American worker and stuffed into the pockets of the 1%er CEO Managers. The states should sue. They clearly have standing, as Obama’s lawlessness is burdening state taxpayers with billions of dollars in additional expenses, depriving legal residents of jobs, and exposing citizens and legal residents (especially those in the border areas) to increased crime (as Obama’s amnesties encourage and incentivize even more illegal immigration). State elected officials have a duty to their citizens. If congress won’t act against Obama’s tyranny, then the states must. Gee, I’m not a “Professor”, but, obviously, any funding bill originating in the House could prohibit the specific misuse of such fees, and if the President wanted overall funding for our bloated government, he would have to accept that, and refrain from exercising a veto. If not, HE would be the one shutting the government down over an obscure fee system. But we all know that the RINO’s not only would be scared to take a such a small, principled stand, they don’t even want to do that, because they are a fat and happy part of the beltway elite. So it has nothing to do with a “serious change in the law”: it all has to do with Republican cowardice and betrayal of its base. Of course, as a wishy-washy alternative that may look like action, the Republicans can pathetically throw themselves on the mercy of the courts – that always works out so well, doesn’t it? Well, yes. I HAS worked out well. The Supremes have UNANAMOUSLY bench-slapped the Obami a smooth baker’s dozen times. PLUS, addressing a conflict like this one in the courts DOES have the virtue of following the Constitutional scheme, which you at least pretend to favor. Again, that’s not the only avenue of attack. But it certainly is ONE perfectly good avenue. As to the defunding…how ’bout we pressure our own people and watch and see before slitting our wrists. Remember what Milton Friedman said about pushing less-than-perfect people, since you can’t ever elect perfect ones. Any ‘solution’ that involves ‘shutting down the government’ may sound good, but isn’t practical. Of course, we should go back to regular budget order and produce nine separate funding bills, so the ‘shutdown’ would only involve the agencies funded by the one bill. But the self-funding nature of the ICE process would mean they could likely continue anyway. Even a plurality of Republicans opposed the 2013 shutdown, and independents disapproved by 2-1. That just isn’t a winning or sustainable strategy, it’s just a naive reaction. I don’t think we are that far apart. I don’t have a big problem with a lawsuit, and I am not hoping for them to became the Founding Fathers, or the ’85 Bears defense; but once, just once, I want them to stand up to this guy, who is a very bad person, on their own, without concern for their future “political viability.” If they can’t do that, I fear that we are all finished. The Court packing will be complete, the new electorate of government dependents will constitute a super majority, and the RINO’s will be pensioned off and happy. And, most importantly, I don’t want to spend the rest of my days having to watch World Soccer. I get you. On the other hand, I WANT my Congresscritters to be VERY concerned about their future viability in office. I want them to understand many of us will be coming for their hides if they fail to do right here. I’m looking at YOU, John Cornyn, and YOU Kevin Brady. One of the best tacks the Republicans can take is to go after laws that require either union workers or prevailing for government contracts. They should point out the historical racism and exclusiveness of unions in the past and argue that in order to correct historic discrimination these new workers be given priority in jobs. On one hand, I LIKE the way you think (dirty). On the other, the unions are pushing this amnesty, I expect because they see these works as new grist for their mill, and like the rest of the Collective, they know they are losing with Americans. It is the union bosses that are pushing amnesty. They do not and have never cared about the rank and file and this amnesty will hurt the rank and file. The job of the Republicans is to make sure it hurts the rank and file and that they know who did it to them. Non union contractors that hire these new workers should have the same bidding rights as union contractors. Republicans need to push to get rid of the requirements of prevailing wage laws and closed shop laws in order for our new workers to have an opportunity to work and live the American dream. For far too many years the trades were closed to minorities. Now it is time to level the playing field and give these new workers a fair chance to make up for lost opportunities. Our strength is derived from a diverse workforce where workers who were formerly discriminated against by unions are granted priority in hiring until parity is reached. Start by repealing Davis-Bacon and making all states right to work states. It’s for the new workers and their children. Workplace diversity is our strength. 2. any apparent attack on Davis-Bacon (one of the MOST egregious Collectivist laws EVER) would congeal the unions like you’ve never seen. Maybe it’s time for that. Dunno. A carpenter’s gang of all white, all black, all East Indian, all whatever…or any mix thereof…no freakin’ difference. “Diversity” never drove a nail or sawed a stud. It’s all just guys (in the non-gender-specific). But, yeah, the unions were a cess-pool of racism, which was one driver of “solidarity”. The point is to use the dialogue of the left against the left. Here’s the deal… up until President Obama signed the new law it was against the law to hire these workers. Institutional racism pure and simple. Now we need to make up for past wrongs. Level the playing field. Increase diversity. Best way to do that is get rid of “Jim Crow” type laws such as Davis-Bacon and closed shop laws. Republicans need to convince America that these laws have been used to discriminate and to continue institutional discrimination. Sitting around and throwing tantrums is not going to get us anywhere. We are never going to deport 2, 5, 7 or 22 million people. Forget it. We need to make sure the pain is focused on those that have supported democrats and democrats policies. Making all states right to work states and getting rid of Davis-Bacon would be a fair trade for this amnesty and it can be done using the language of the left. Again, I LIKE your thinking. See some impediments, and a couple of actual flaws, but it is diabolical. Do you EVER get tired of making a fool of yourself? “right to work” = right to mooch. It’s an ongoing function, the appropriation isn’t made every budget cycle. Look for this putz Boehner to do nothing. Zero. Zip. Many of us believe Boehner has been extorted ever since he became Squeaker, which probably accounts for his outrageous selling out of the GOP base and enabling of President Ebola’s outrageous acts. A weaklings and backstabbers like Boehner are easily corrupted, and he probably began being corrupted the day he was elected to Congress. A a-hole like him has probably committed ‘light’ corruption a thousand times, and those acts are no secret to people likely holding them over his puny head. There is no real discussion of anything intelligent so long as this loser is tolerated by us as the most powerful people in the GOP’s group of little girls hogging the GOP leadership. The gop leadership wants amnesty. Behind their faux outrage they are counting more dollars of personal gain. Which is why nothing will happen, just a bunch of talk/bluster and decade long court action. They can stop Obola anytime with the power of the purse, but they.will.not.do.it.